StFX’s Computer Science program is celebrating much good news—including a Maclean’s magazine ranking that shows the program is leading the country in research in the field weighted citation impact category. StFX is tied with the University of Toronto for this honour. Additionally, StFX’s Computer Science program is the top ranked in Atlantic Canada in Maclean’s for the third year in a row. And StFX computer science students are fresh off a successful showing in the Science Atlantic Mathematics, Statistics and Computer Science conference where the computer science team of Darwin Groskleg, Brandon Anthony and Thomas Ciha placed so well they earned the right to advance to the North American North East regional competition held Nov. 10. StFX student Katie MacEachern also received second prize in the Computer Science Research Oral category at Science Atlantic, while Cynthia Forgeron received third prize in that same category. StFX computer science faculty are gratified with the recognition of the program’s many strengths. "Our field-weighted citation impact index rank, a measure of research output, is tied for number one in the country," says computer science professor Dr. James Hughes. “That’s great news for students who are at all interested in becoming involved in research,” says colleague Dr. Jacob Levman, Canada Research Chair in Bioinformatics. 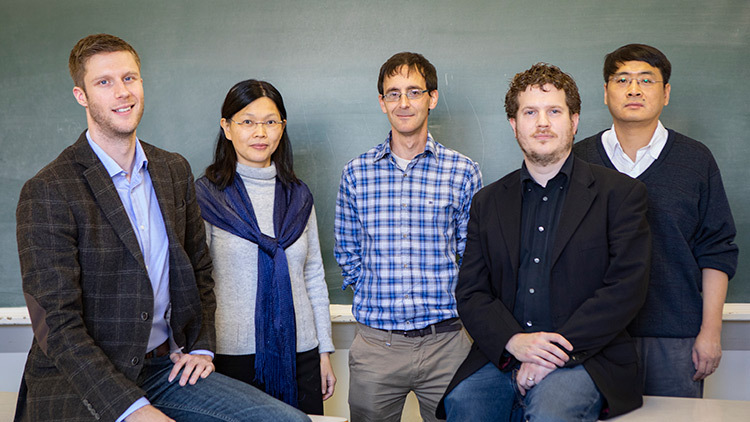 StFX computer science faculty conduct research in areas such as machine learning, data science, artificial intelligence, bioinformatics, cloud computing, internet of things, computer vision, and energy-aware management for embedded systems. Working with faculty can be an integral part of the student experience at StFX. “Many students have the opportunity to be involved in computer science research,” says faculty member Dr. Iker Gondra, who notes the department’s annual Alley Heaps Summer Research Internship Award as one of the opportunities available to students. Students also have opportunity to get involved with faculty projects. For instance, Dr. Laurence Yang organized the international 2018 IEEE Cybermatics Congress and StFX students had the chance to participate in that event. Drs. Levman and Hughes says involvement in research provides students with challenging, real world experience and goes above and beyond what students may see in the classroom. Dr. Man Lin says another strength is the continuing effort computer science faculty members put into keeping up with new developments in the rapidly evolving field of computing, and introducing new courses on emerging topics. StFX offers courses that meets the needs of a broad range of students, she says. It also offers a master’s program, an opportunity for undergraduate students to work with faculty in summer research projects, a co-op program option and a pre-education concentration for those interested in teaching. Dr. Gondra says faculty spend much time with the students so that they are well prepared when they finish their degrees.